This report presents the findings of LB Camden’s Youth Safety Task Force’s investigation into the causes and nature of youth violence in the borough. A partnership approach to safeguarding young people in the borough founded upon case management of vulnerable young people, police visits, engagement of neighbouring boroughs, provision of diversion and schools’ engagement. 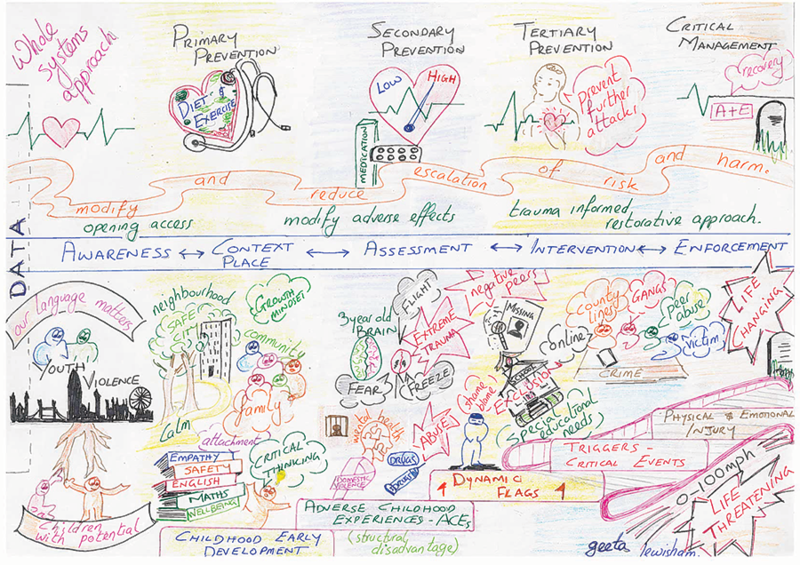 This diagram details a whole systems approach to serious youth violence by Geeta Subramaniam, Head of Public Protection and Safety, LB Lewisham and Chair of London Heads of Community Safety and Youth Offending Team Assistant Directors Network. A guide for all practitioners who are working with adolescents in LB Waltham Forest. It aims to equip practitioners with up to date information on adolescent development, and to provide a consistent practice framework to improve our response to adolescents who experience risk of harm. The approach includes information on enforcement and support and recognises that safeguarding adolescents may involve different combination of these elements at different times. London South Bank University report commissioned by LB Waltham Forest detailing how gangs have changed in the borough. Harrow community safety delivery plan. Bid paper for one of the five funded projects for Tranche 1 of LCPF Co-commissioning fund. Delivering a pan-London project to improve the identification and response to the exploitation of young people by organised criminals. Lambeth’s Safeguarding Children’s Board’s (LSCB) strategy to support, help and protect children and young people at risk of a range of what are often termed ‘contextual’ forms of abuse, including child sexual exploitation (CSE), those who may be involved in violent crime and/or gangs and/or ‘country lines’, or of radicalisation. Produced through London Councils, to promote effective practice for when a person with evidenced gang links, moves from one borough to another. It is intended to provide clear principles for effective information exchange and handover, to ensure that any risk presented from or to the gang member is fully understood; and any support package in place can be effectively reviewed by the borough or authority to which the gang member moves. This guide is made available to London boroughs to use and adapt as desired.